Edward Burne-Jones, “St. 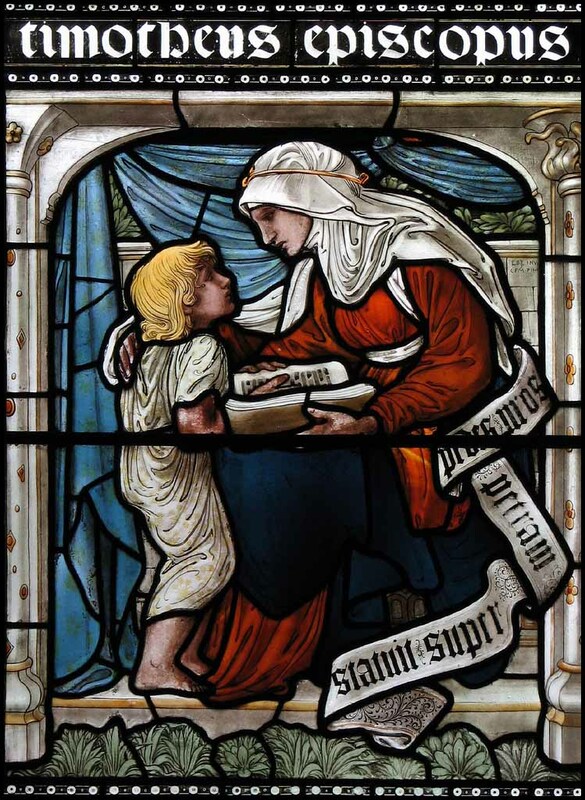 Timothy and His Grandmother Lois” (c. 1872), Vyner Memorial Window in Oxford Cathedral. Bio: St. Timothy had Christian believers in his family. His mother, Eunice, was a Christian woman and was the daughter of a Christian woman named Lois (2 Timothy 1:5). Acts records that St. Paul met Timothy on his second missionary journey and wanted Timothy to continue on with him (16:1-3). Over time, Timothy became a dear friend and close associate of Paul to whom Paul entrusted mission work inGreeceandAsia Minor. Timothy was also with Paul inRome. According to tradition, after Paul’s death, Timothy went to Ephesus, where he served as bishop and was martyred around AD 97. Timothy is best remembered as a faithful companion of Paul, one who rendered great service among the Gentile churches. Since St. Paul and St. Timothy were dear friends, they were put beside each other in the calendar, and also on the day of St. Timothy, the Gospel of John 15:9-16 is read, which speaks of pure love and friendship. As the old saying: what’s good the goose is good for the gander. In other words, Paul’s counsel and exhortation to his dear brother and fellow pastor, is also for every brother and sister in Christ being formed in His school of the Holy Spirit. Paul not only wrote to Timothy but also to us. As the Lord inspired clearly the Apostle, this is the Lord’s Word to you. As the old saying: what’s good the goose is good for the gander. In other words, Paul’s counsel and exhortation to his dear brother and fellow pastor, is also for every brother and sister in Christ being formed in His school of the Holy Spirit. Read the Apostle’s letters to Timothy as addressed to you personally and finally it is not Paul who is writing you! Part I is from the blog Aardvark Alley. Part II is my reflection on the day. Today we commemorate Saint Timothy, Pastor and Confessor. The festival days for Pastors Timothy and Titus are set on either side of the day marking Saint Paul’s conversion. This proximity reminds us of their connection with the apostle, including his establishing them in office and the letters he wrote to them. Timothy grew up in the faith as taught by his mother and grandmother, Eunice and Lois. He was a companion of Paul for many of the apostle’s travels and spent much of his own pastorate in Ephesus. Timothy is mentioned in Acts 16-20, and appears in 9 epistles either as joining in Paul’s greetings or as a messenger. Additionally, two of Paul’s three “pastoral epistles” — 1 Timothy and 2 Timothy — were addressed to him and his congregation. The letters Paul wrote to Timothy and Titus are collectively known as the Pastoral Epistles. Much of Christianity’s understanding and practice of the pastorate comes from these three relatively brief letters. Let us pray…Lord Jesus Christ, You have always given to Your Church on earth faithful shepherds such as Timothy to guide and feed Your flock. Make all pastors diligent to preach Your holy Word and administer Your means of grace, and grant Your people wisdom to follow in the way that leads to life eternal; for You live and reign with the Father and the Holy Spirit, one God, now and forever.